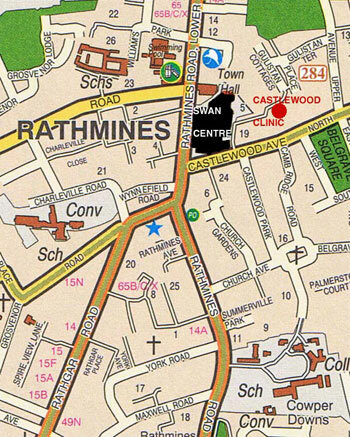 Castlewood Clinic is situated in the small road behind the Swan Centre where the car park is. Coming from the Rathmines Rd, Castlewood Terrace is the first turning off Castlewood Avenue. This is where the car park is to the Swan Centre. Follow the Terrace to the right. At the end of this part of the Terrace is a "no through road " sign and a pay and display machine. Number 19 is the third building after this point. Parking: There is some pay and display parking outside the clinic. Alternatively park in the Swan Shopping Centre car park.